It’s the Gold Rush in Australia – a time when bushrangers are rife and travellers, both local and international, are aplenty in the harsh buslands of northern Victoria and New South Wales. Young Hugo Mars and his wealthy Papa are on an intrepid voyage to Australia to research stories for a French magazine (edited by Jules Verne), when their coach is held up by none other than the infamous Harry Power – the gentleman bushranger. Brave, smart and clever, Hugo Mars is as intrigued as his Papa by this odd, self-inflated bushranger – and this event is the catalyst for a series of incredible encounters that will take a curious 15-year-old boy into the lair of the Kelly gang and their infamous inlaws, the Quinns . . . but as a friend, not foe. It also take us through the plotting and eventual capture of Harry Power, and the convoluted associations that kept him in business so long. This intriguing book does indeed hold a Ned Kelly secret – but even more than that, it holds close a tale of commitment to family, to betrayal and honour. Its central theme may be the power of friendship but its cleverly-crafted plot and insightful, fascinating relationships – all based on fact and factual characters – is multi-layered and richly rewarding. 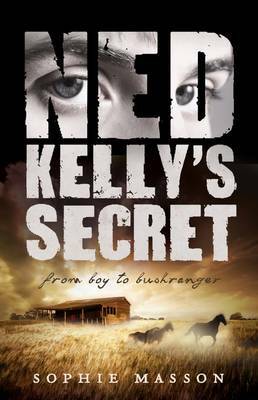 Author Sophie Masson has herself admitted in her author’s notes that the aim of this book was not to laud Ned Kelly and his questionable career, but rather present an open-ended question about how, where and why, a smart, spirited, 15-year-old Ned Kelly (the juvenile bushranger) eventually turns from mere horse wrangler to murderer and questionable ‘hero’. Masson asks what the pressure of saving face and strong family ties plays in his downturn and eventual violent end – and Ned Kelly’s Secret indeed perfectly addresses this question through historical conjecture and with much diplomacy (and perhaps with a wee dram of tenderness). I loved this book. Well-written, balanced, meticulously researched and with a cast of brilliant characters – mostly real but some imagined – I adored how Masson ran her foreign Hugo Mars character – a kid with enormous hope and promise – alongside his age-contemporary friend Ned, whose destiny was as sordid as his early days of crime. But did it really need to end this way? Is a life of crime really in the blood or is it driven by need, greed and betrayal by others? Could things have been different for young Ned Kelly? This book makes you think, it makes you wonder. It opens your heart and it’s just all round great reading. I am only hoping Masson brings us another Kelly tale – perhaps this time about the fate of the remaining Kelly clan, whom she paints with sheer wonder. Ned Kelly’s Secret is published by Scholastic. You mention Ned as a murderer, but he was in truth pushed by the police at the time , particularly constable Fitzpatrick who while drunk went to the Kelly house to arrest Dan and was shot in the hand by his own pistol while trying to harrass Kate. The 3 police who were shot at Stingybark Creek were called on to surrender but fired the first salvos. Murderers?? no..A victim of the times with the main crime of being Irish Catholic in a British Protestant run country. And trust me, the bigotry has happened to me as well.